Georgia Mountain Cabin Rentals is happy to offer affordable nightly rates in beautiful Blue Ridge, GA. These cabin rental deals are unbeatable and perfect for those on a budget! 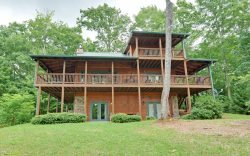 Whether your searching for a Toccoa River cabin or a pet-friendly vacation cabin we have a fantastic selection to offer you for your North Georgia mountain vacation. Book your affordable and cheap cabin rental in Blue Ridge today! For additional Blue Ridge rental deals and specials be sure to check out our ever-changing offerings. From year-round discounts to holiday and low season specials. Baby Bear - Mountain Views and Spacious Skies! Bucksnort Lodge - The U.S. Forest Preserve is your backyard! Bear Pause - Cozy and delightful waterfront cabin in the woods! Dancing Bear - Perfect cabin to refresh your spirit!